However, the top three prizes -- World Champion, First Runner-up and Second Runner-up -- were from Switzerland, Italy and Switzerland. One of my favorite memories of cheese (and yes, there are many) involve a trip I took to Switzerland when I was in high school. Our 4-H team had won the National 4-H Dairy Cattle Judging Contest (Kentucky, 1986, for you trivia buffs out there), and part of the prize was we'd raise money like crazy and we poor farm kids would get to go to Europe for roughly a month. A good deal of our time was spent in Switzerland. I've still got the slides of a guy making cheese in a huge copper pot in a barn way up in the mountains near Interlaken, Switzerland. Fascinating, and the cheese he'd already made and offered to us is, to date, one of my most vivid food memories. 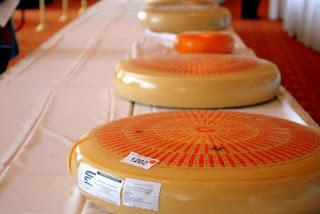 There were 79 classes of cheese judged in this year's contest. That number may seem mind-boggling to folks who've never ventured beyond Cheddar and Pasturized Process American Cheese Food, but it's really only a fraction of the cheeses produced in the world. 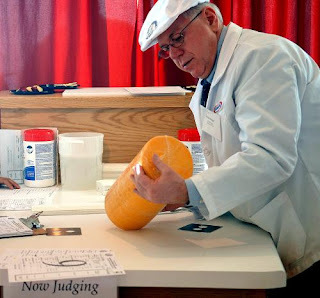 If there were a heaven for judges, it would involve a cheese contest. I'd walk into the contest room and see a sight like the one in the photo to the right and faint. The other night, Emeril Lagasse had a demonstration on his show Emeril Live! on making homemade cheese using a rennet -- an enzyme that rapidly speeds the curdling process. He was making fresh goat cheese, and his description of the flavor reminded me of a sample we had from a farm in Piedmont in the northern end of Calhoun County that has goat cheese.